The capital city of Tatarstan republic. Kazan, a city in Russia and a large river port on the Volga River, is the capital of Tatarstan Republic, located about 820 km east of Moscow. 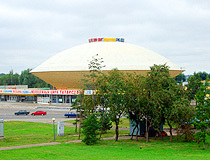 It is one of the most important economic, scientific and cultural centers of the country. The population of Kazan is about 1,205,600 (2015), the area - 425 sq. km. The phone code - +7 843, the postal codes - 420000-420141. Local time in Kazan city is April 20, 10:11 pm (+3 UTC). 6 March, 2018 / Winter in Kazan - the view from above. 4 December, 2017 / Stadiums and Matches of the World Cup 2018 in Russia. 29 June, 2017 / Bulgarian Historical and Architectural Museum-Reserve. 14 July, 2016 / Kazan Kremlin and the fireworks on the City Day. 13 March, 2016 / Official Look of Host Cities of World Cup 2018 in Russia. 10 July, 2013 / The situation in Kazan Universiade becomes ridiculous. The Russian team is leading with a total 82 medals, including 41 gold medals. However, the closest pursuers, Japan and South Korea, have 6 gold medals. Russian sports officials apparently are eager to show excellent results. That's why Russian champions of the Olympic Games, World Championships are included in the team. A brilliant solution! 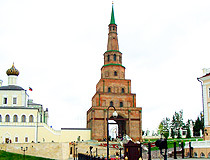 According to the official version, Kazan was founded no less than 1000 years ago. The evidence is a Czech coin found on the territory of Kazan Kremlin and dated approximately 929-930s, as well as other items with less clear dates. Kazan was founded as an outpost on the northern borders of Volzhkaya Bulgaria. In the 13th-14th centuries, Kazan rapidly developed and became an important trade and political center of the Golden Horde. The favorable geographical location on the trade ways connecting East and West was the reason for the growth of Kazan. 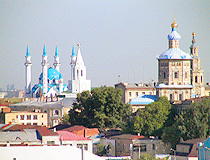 In 1438, Kazan was declared the capital of the Kazan Khanate. There were several conflicts with the Moscow state and as a result the town was conquered by the Russian Tsar Ivan the Terrible in 1552. After the rebellion was finally suppressed, Kazan began its new history as part of the Russian state. In 1556, the construction of the new, white stoned Kremlin began. About 7,000 Russians were brought into the almost empty town. 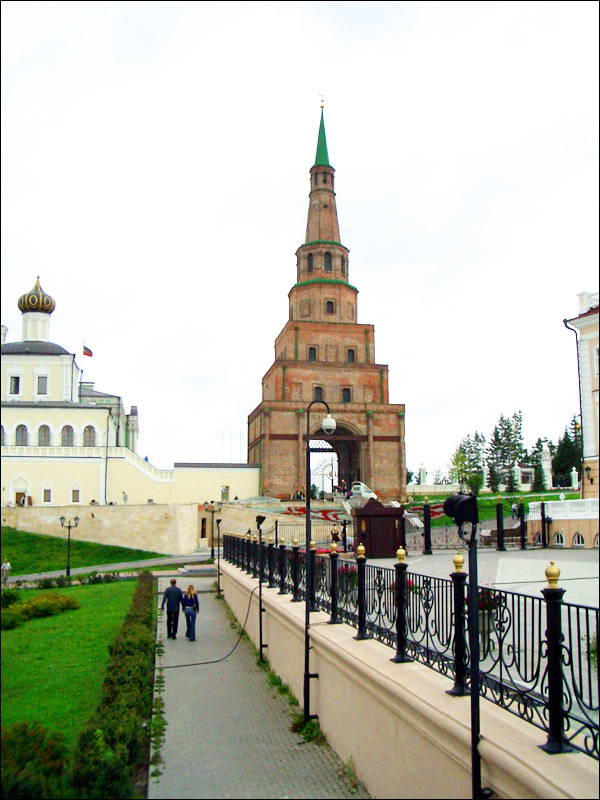 In the 17th century, Kazan grew economically and new manufacturing factories came into being. In 1708, it became the capital of large Kazan gubernia (province). From 1760s, the first wooden roads were built as well as bridges across the Bulak and the Kazanka rivers. By the end of the 18th century, about 22,000 people lived in Kazan, together with suburbs - over 40,000, and only about 10% of them were Tatars. The city became an educational and cultural center of the Volga region: in 1758, the first provincial gymnasium was opened in Kazan, in 1771 - the first madrasah, in 1791 - a theater. In 1804, the Kazan University was established - the third in Russia - and the city became a large scientific center. In the 20th century, it experienced a lot of events. 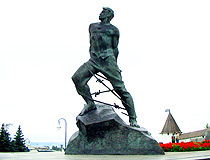 Kazan became one of the centers of revolutionary movement. In 1918, during the Civil War, heavy battles were held for Kazan. In 1920, the Tatar Autonomous Soviet Socialist Republic was formed. In 1930s, intensive industrialization of Kazan began. At the same time, the population rapidly grew. During the World War II, a lot of plants were evacuated to Kazan as well as some branches of the USSR Academy of Science. In the post-war period, Kazan intensely developed. In 1979, the population was over 1,000,000. 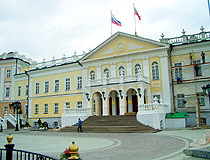 In 1990s, the city became one of the financial and political centers of Russia. The 27th World Summer Universiade was a global student-youth sports event held in Kazan in July 6-17, 2013. More than 350 sets of medals in 27 sports were awarded to athletes from more than 170 countries. 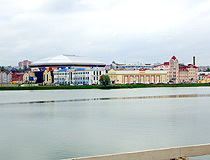 Kazan was the northernmost city of Summer Universiade capitals. Nowadays, the World University Games remains the main student sports competition in the world. The World Summer Universiade can be compared with the Olympic Games. About 60% of the athletes usually perform at the Olympics later. The mascot of the Universiade was winged white leopard kitten, named Uni. Winged white leopard Ak Bars is the national and historical symbol of Tatarstan, it is depicted on the State Emblem of the Republic. Kazan Universiade logo was a stylized tulip with the stars made in the Olympic colors of the five continents and the corresponding text in Latin letters. 6 matches of FIFA World Cup 2018 were played in Kazan. From the Tatar people language the word “qazan” means a “boiler” or “cauldron”. 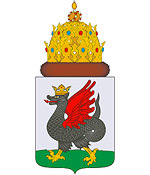 The historical symbol of Kazan, depicted on its coat of arms and flag, is a mythical dragon-creature Zilant often mentioned in local legends. Kazan climate is temperate continental, extreme cold and scorching heat are rare and not typical for the city. The average temperature in January is minus 10.4 degrees Celsius, in July - plus 20.2 degrees C.
National composition of the population of Kazan: 48.6% - Russians, 47.6% - Tatars, 0.8% - Chuvash, 0.4% - Ukrainians, 0.3% - Mari. 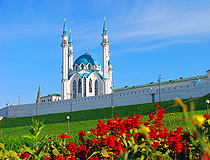 Today, Kazan is the cultural center of the Tatar people. The city has been undergoing a total renovation since 2000. Kazan metro was opened in 2005. The city celebrated its millennium in 2005, when one of the largest mosques in Russia (Qolsharif) was built inside Kazan Kremlin walls. Also, Millennium Bridge was opened in 2005. 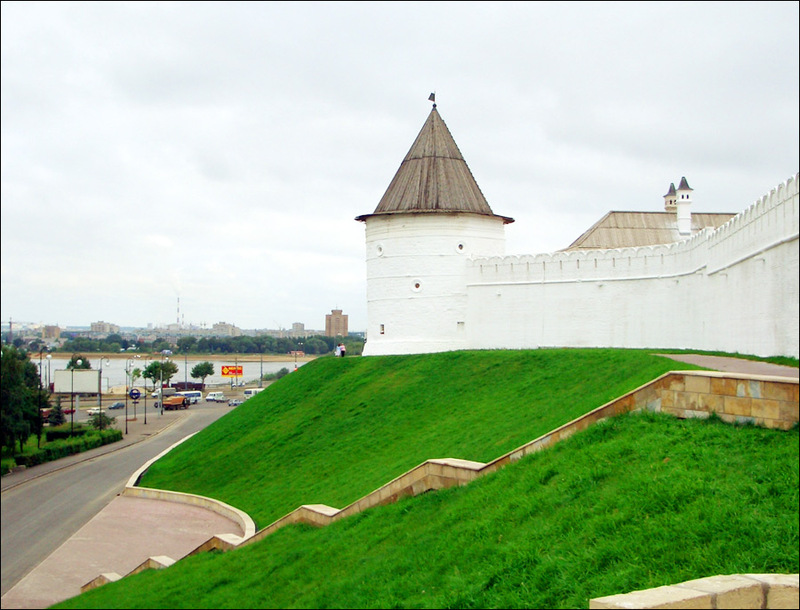 Kazan Kremlin is included in the UNESCO list of monuments of world heritage. 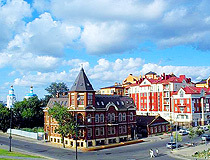 Present day Kazan is one of the most popular Russian cities among domestic and foreign tourists. About one million tourists visit Kazan a year. The international airport “Kazan” is located about 26 km to the south-east of the city. A number of domestic (to Moscow, St. Petersburg, Chelyabinsk, Ufa, Ekaterinburg, Novosibirsk, Sochi, and others) and foreign flights (to Almaty, Baku, Dubai, Helsinki, Istanbul and others) are available. The airport was reconstructed in preparation for Kazan 2013 Summer Universiade. 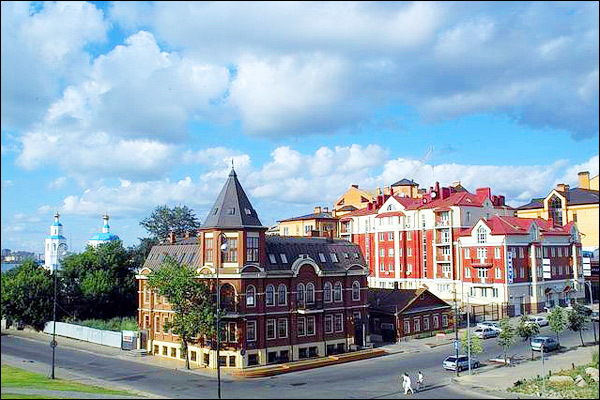 The railway station is located in the central part of Kazan. The main building of the station was constructed in 1896. Kazan is connected by bus transportation with all the towns of Tatarstan Republic, and neighboring regions. Buses to Naberezhnye Chelny, Chistopol, Nizhnekamsk, Bugulma, Almetyevsk, Bavly, Ufa, Sterlitamak, Ulyanovsk, Samara, Orenburg, Cheboksary, Yoshkar-Ola, Busuluk run from Kazan every day. There are also international routes Kazan - Baku, Kazan - Aktobe. 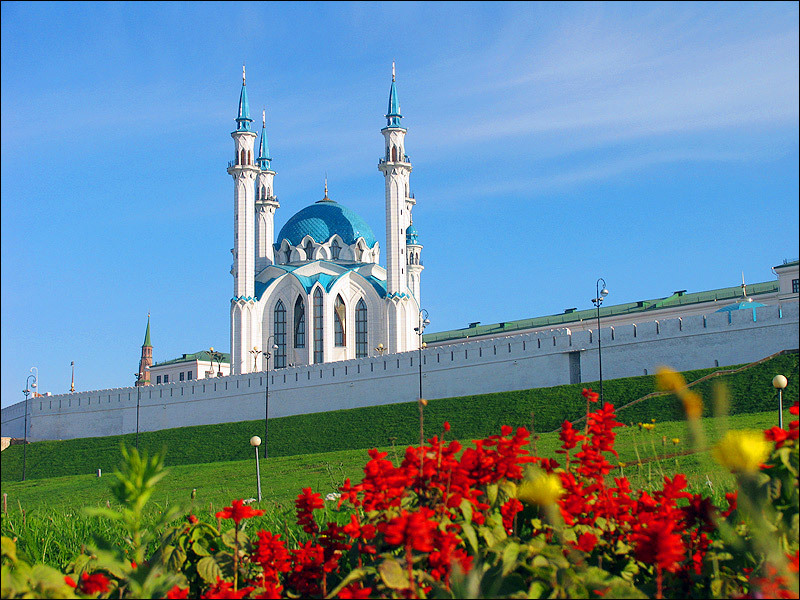 Kazan has a lot of museums, including 34 state museums, several public and private galleries. 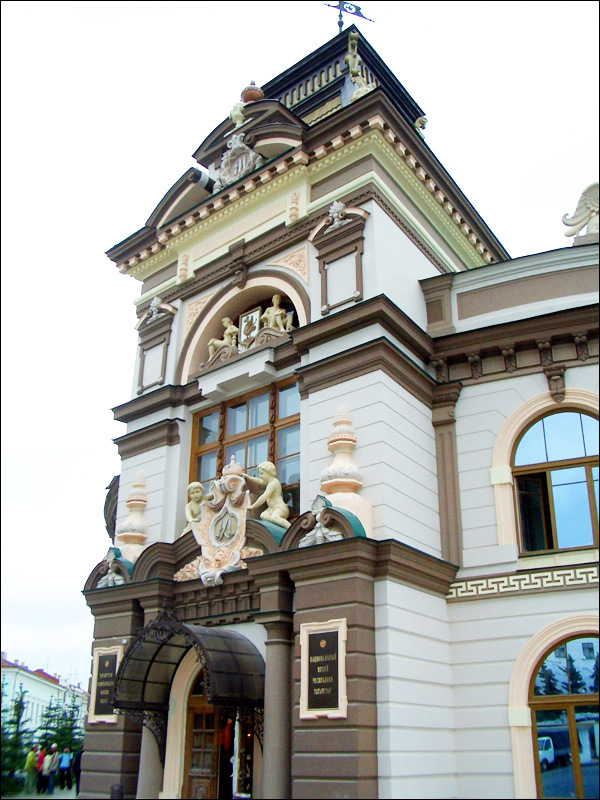 The largest museum of the city is the National Museum of Tatarstan Republic, founded in 1894. You can find the most valuable natural science, archaeological, ethnographic and other exhibitions in the main building of the museum built in 1800-1815 (Kremlin Street, 2). Inside the Kazan Kremlin, there is a branch of the State Hermitage. Also, the Museum of Fine Arts of the Republic of Tatarstan (Karl Marx Street, 64) and The Museum of Kazan Millennium (Sultan Galiev Square, Pushkin Street, 86) are among the most popular museums in the city. 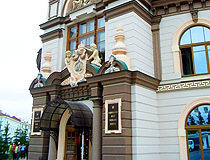 Kazan State Academic Russian Bolshoi Drama Theater named after V.I. Kachalov (Bauman Street, 48). 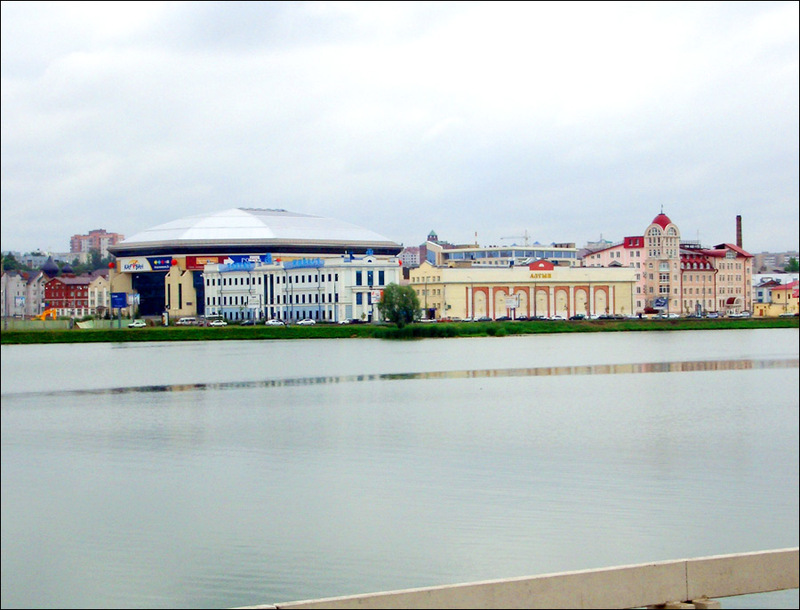 Also, Kazan has a circus (one of the leading in Russia with a unique building) and 12 movie theaters with 61 screens, including Simex 4D. 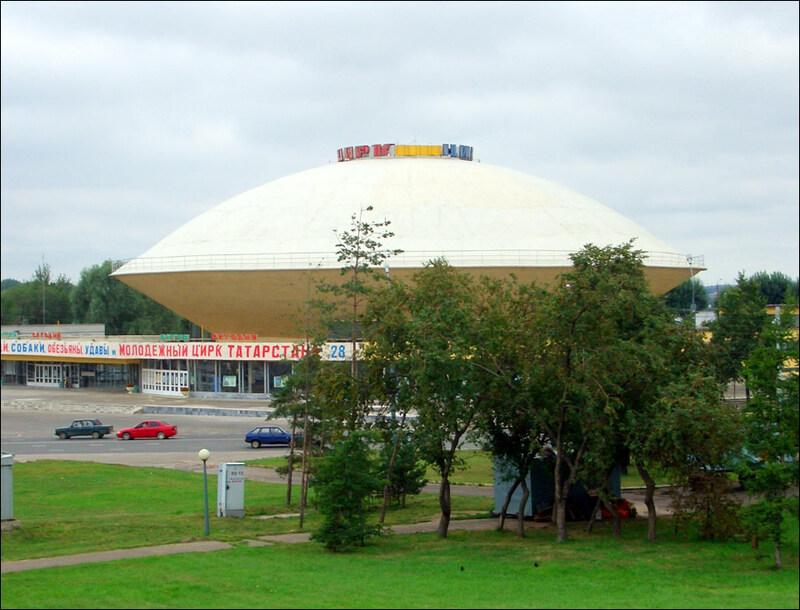 Concerts, performances and other cultural and entertainment events are held at the State Concert Hall named after S. Saidashev, the cultural-entertaining complex “Pyramid”, sports and mixed-use complexes Basket-Hall, Tatneft Arena, the Sports Palace, UNICS and other venues. 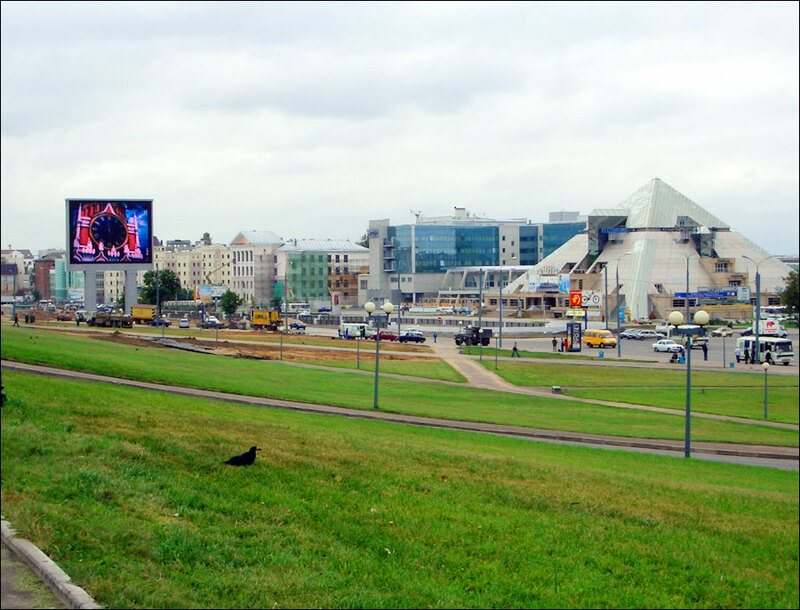 Kazan has a lot of parks. The most ones are the amusement park “Kyrlay”, Millennium Park, Victory Park, Uritsky Park, Central Park, as well as Russia’s oldest and one of the the oldest in Europe, Kazan zoological and botanic garden. The Kremlin is a favorite destination of tourists coming to Kazan. You can buy a lot of different souvenirs and gifts there. The historic center of Kazan was rebuilt in 1990-2000s in preparation for the celebration of the millennium of the city. Some historic buildings and monuments were demolished. Today, the most valuable areas in terms of historic buildings are Bauman Street, Kremlin Street, Mushtari Street, Karl Marx Street, Maxim Gorky Street, Gabdulla Tukai Street, Bulak channel area, Svobody Square, Old-Tatar sloboda. Tourists and pilgrims also visit Peter and Paul Cathedral, Kazan Virgin Monastery, unique historical and architectural complexes of Raif monastery and island-town Sviyazhsk located near Kazan. 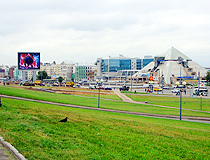 In the 21st century, Kazan received several new high-rise buildings. Since 2008, the tallest building in Kazan was the 85-meter 26-storey hotel “Riviera”. Today, the tallest skyscraper in Kazan is the 35-storey residential complex “Lazurniye Nebesa” (122 meters). I have found the following list of Halal restaurants in Kazan. If you are going to visit Kazan, there are several international flights available connecting Kazan (Kazan international airport) with Istanbul (Turkey), Frankfurt (Germany). It is safe enough because a lot of people in Kazan and Tatarstan are Muslims. Of course the risks are much lower if you don't walk alone in the evening/night time, especially not in the center of the city. nyla asks: How big is the port of Kazan and can it handle large oil tankers? Kazan river port is the largest one in the Volga region. 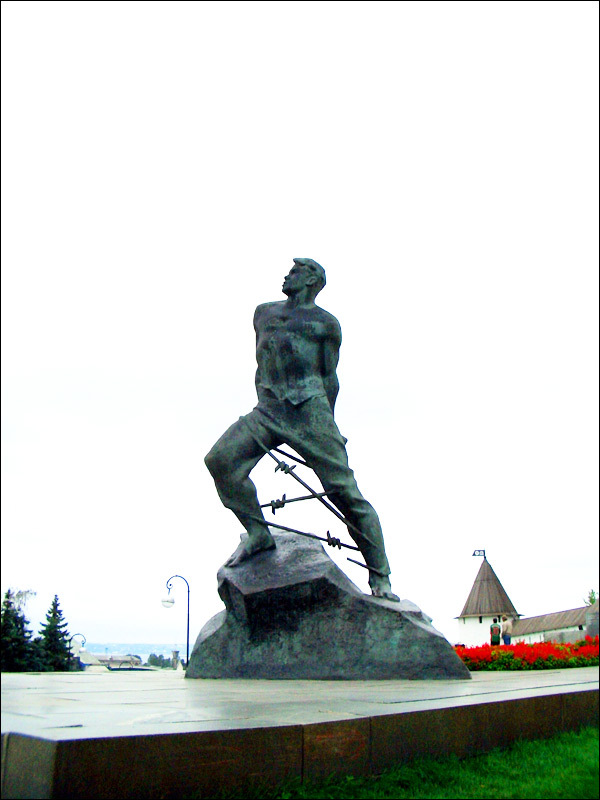 The port operates for 57 km up the Volga River, 123 km down the Volga, 340 km up the Kama River. The port accepts Kuznetsky coal, building materials, industrial goods, food products. There is no infrastructure for large oil tankers or container ships. Also I am not sure if these ships can reach Kazan port because of the numerous hydro power stations built on the Volga.